Ghost Hunter shows, I hate them, movies about ghost hunting, I hate them. Paranormal films, I can take or leave them. Found Footage films, I can also take or leave them. It’s not that I’m a snob I just find them rather dull. I remember when Paranormal Activity came out and everyone around me was scared and jumping and screaming. At what?! A lamp turning on. Preposterous. I remember people literally drenched in fear at one point where you hear a crash and they see there chandelier has fallen. Come one really? And until I see a ghost come and eat someone on one of those shows I will continue to find them dull. My wife however, who, yes I will admit wears the pants in the family is a huge fan. That’s why I sit through them. The other day I got the film Alone in the Ghost House. She was right excited to watch it so we turned it on. I must say I was pleasantly surprised. It’s the story of Ghost hunters Lana and Derek, there not really ghost hunters in that horrible History Channel way, they actually have a pretty cool gimmick. They go to supposed haunted sites tell you what happened to make it haunted, give you the rundown on the local legends and so on. The hook is Lana is a skeptic so she will prove there’s nothing to be scared of by staying the night in these haunted locals. They are joined by their wisecracking cameraman and friend, and go from area to area filming these encounters. For their next show they decide to head to “The Devils Commune” It was an old artist commune that was the sight of a grisly mass murder. One of the artists was convinced his girlfriend was having an affair so he killed her, and every single artist in the commune. Its basically never been touched since the murders but appears normal. The only creepy part is the basement where the crazy artist did his work. To spice things up for the show Derek decides to hire a medium he found on craigslist. Ok you have to find that ironic and funny at the same time. Anyway after performing her ritual everything starts to get creepy. 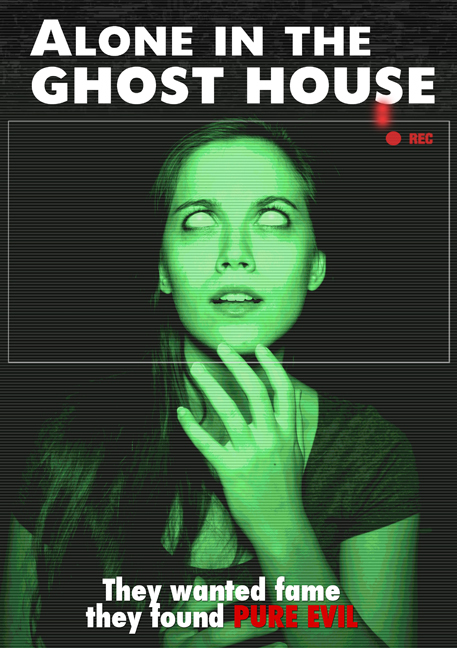 The group is separated in a typical haunted house fashion and we begin to experience strange things. And let me say we get one hell of a pay off in the end. The film works because its set as a show being filmed. The raw look and feel and quick cuts add to the realness of the picture. The cast does an amazing job of showing humor, skepticism, and downright terror throughout the movie. Special effects are minimal but the score and lighting set the mood perfectly. And like I said the ending is great. Probably the best ending I’ve seen to a horror film in years. And I watch a lot of horror films. I enjoyed the approach of our characters being skeptic and filming things for a tv show as opposed to being actually ghost hunters looking to see something that on tv shows never appears. If you dig the ghost hunter and paranormal films this is definitely a must see. If you a fan of horror this is definitely a must see. Bottom line this is a must see horror film. Check it out you will be glad you did.